Sri Lanka have announced their squad for the ODI series against India that begins on Sunday, making five changes from the one that took the field against Zimbabwe. Firstly, Sri Lanka have named 15 players in their squad to face India unlike their 16-man squad against Zimbabwe. While Asela Gunaratne has been ruled out of the remainder of the India series due to a thumb injury he sustained during the first Test at Galle, the likes of Asitha Fernando, Amila Aponso, Lahiru Madushanka, and Nuwan Pradeep have been dropped from the side. Milinda Siriwardana returns to the ODI team after four months while Lakshan Sandakan and Vishwa Fernando have received their first call-ups to the ODI team after performing well during the Test series. Thisara Perera also returns to the squad after being dropped for the Zimbabwe series. Sri Lanka were never expected to defeat India even at home, but with them conceding two 600+ plus totals and suffering two successive innings defeats, it is hard to believe that a few years back, Sri Lanka were considered among the heavyweights. "Sri Lanka dominated in all three formats for a good 18 years - don't forget this now when we are going through a rough patch. Obviously, there are some things we can't openly discuss due to strategic reasons but there are certain areas behind the scenes that need to fall into place for us. 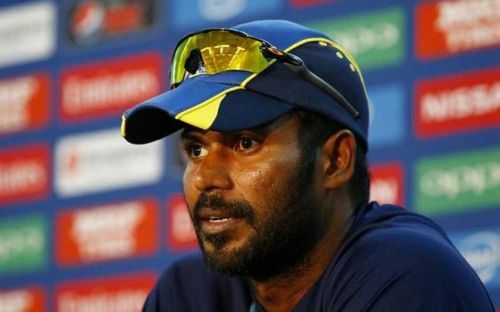 "These areas are being taken care of, and we are seeing the results behind the scenes - however, it will take a little more time for it to be seen externally, so please have patience, and most importantly have faith,” added Tharanga. "Yesterday despite the defeat, we saw spectators cheering us and applauding us - this is what we need. It inspires us to fight harder too - so as the captain of the ODI & T20 teams, I want to appeal to each every one of you."